Six days ago we left our home in Hamilton, heading south. We are still getting used to the need to dress warmly the further south we go. At the southern tip of the north island especially the wind blows fiercely. Yesterday was a typical spring day in New Zealand -- warm sunshine, cool wind, rain, hail, and a 5.1 earthquake! Fortunately, no damage was done. Everyone is skittish about earthquakes, after the devastation of Christchurch (South Island) a few years ago. So much was destroyed the city has yet to recover. 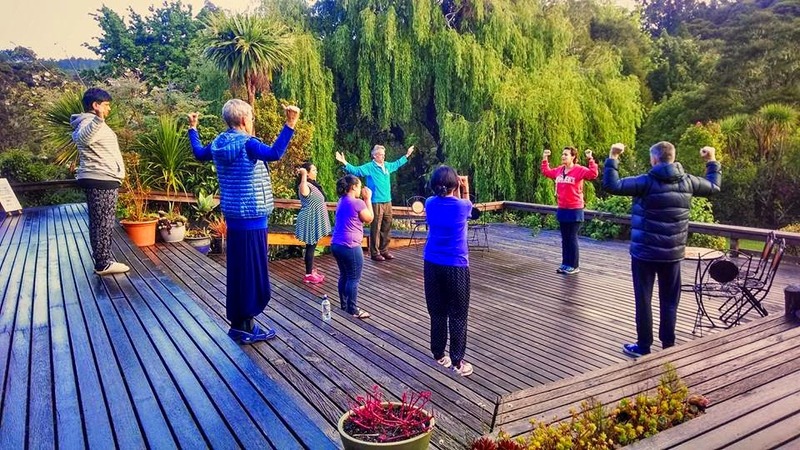 This visit was added to provide Kriya Initiation to 3 new initiates, and a first-time- with-Ananda renewal for 3 Kriyabans. 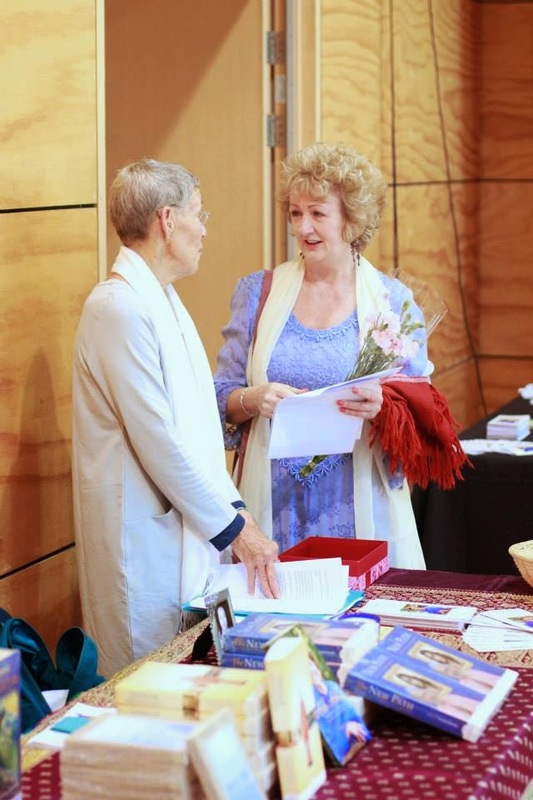 Kavita’s spiritual life started in Palmerston North with a meditation group there. 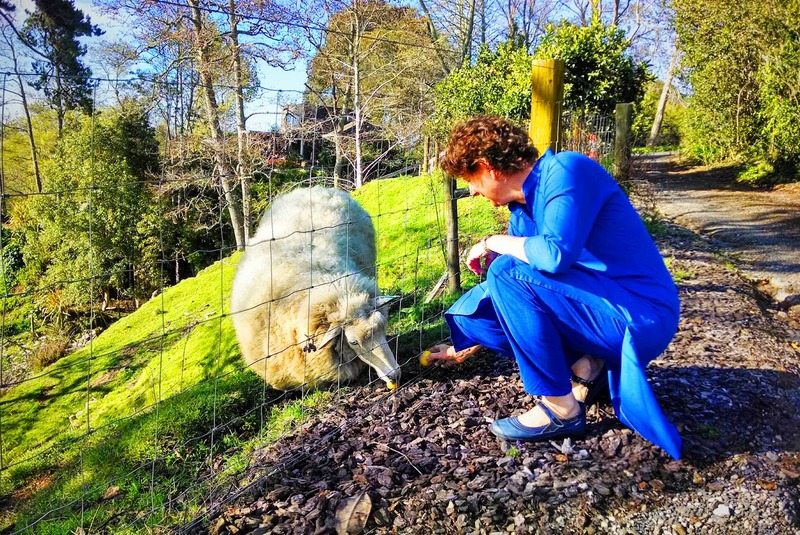 When Kavita discovered Ananda, she naturally wanted to share this with her long-time devotee friends. We arrived on Wednesday and gave a satsang in the very room where Kavita came to know Master, and the next night we gave Kriya there. That was before Ananda had established itself in Europe. Swamiji did programs in many cities, each arranged by individual devotees or small groups. Some were old SRF connections; others had come afterwards. About 5 times during that trip, Swamiji gave Kriya initiation for a handful of new initiates, usually in the living room of someone’s home. Our first acquaintance with Mayadevi and Helmut -- long-time leaders now of Ananda Assisi -- was staying in her parents’ house in Frankfurt, bonding over the making of Kriya drink for the ceremony Swamiji gave there. 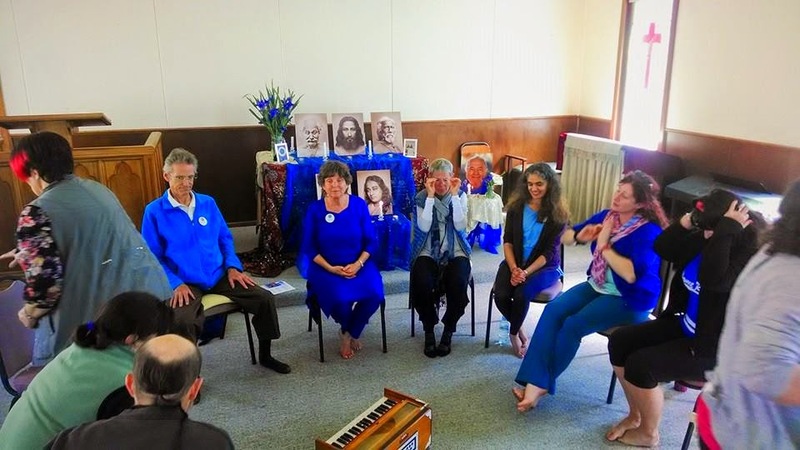 The initiation in Palmerston North was sweet deja-vu of that trip with Swamiji. The fabulous traveling crew rose to the occasion, converted the small living room into a temple to our Masters. Already there were pictures and artifacts, but with permission, we used the pictures we had brought to make it unique for the initiation. 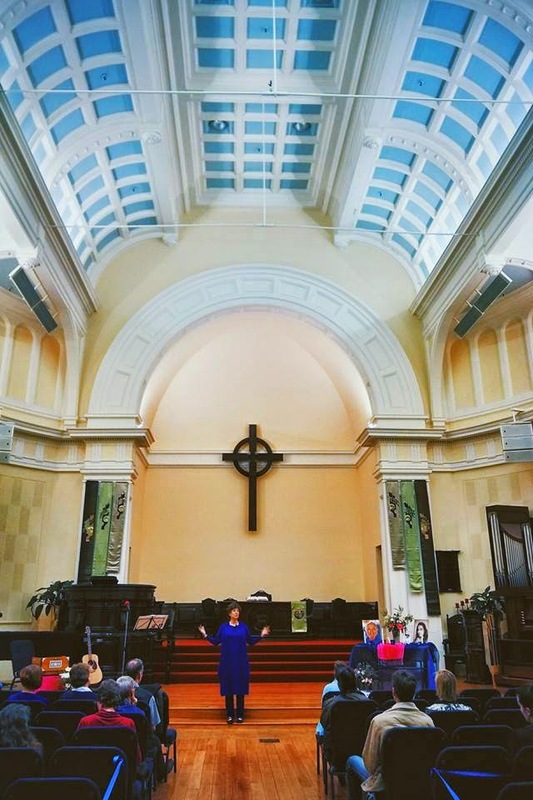 Even though we have all attended many Initiations, this was one of the most moving, because of the uniqueness of the setting and the profound gratitude of those being initiated, both the first-timers, and those renewing. Because of the infrequent occurrence, and the expense of travel, it is unlikely that two of the new initiates could have participated in a Kriya ceremony if we had not come to their very doorstep. Watching each disciple kneel before the Masters and place their offerings with such loving care --- every effort, every expense to bring ourselves to that moment counted as nothing compared to the inspiration filling that small room. 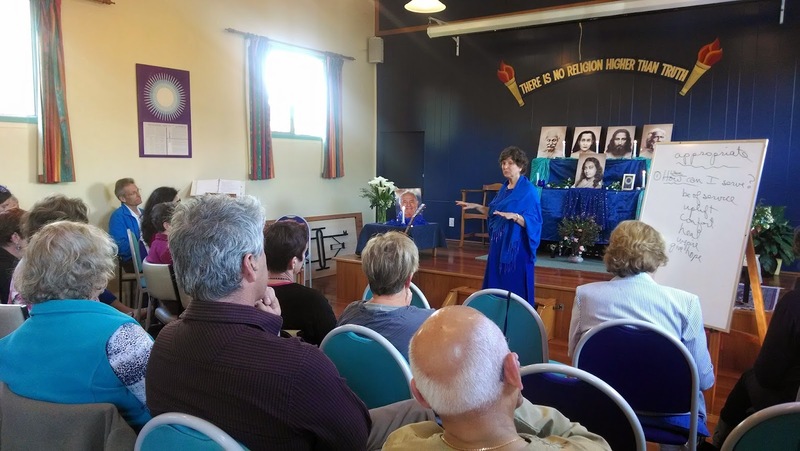 The next morning, greatly uplifted in spirit from the ceremony the night before, and fortified with several cups of “the best masala chai ever,” we left for Hutt Valley, a city within commuting distance of the capital, Wellington. Traveling from Hamilton to Hutt Valley over two days we experienced the amazing variety of this country. Fields in a shade of green that seems more astral than material. Sheep and baby lambs arranged with such pleasing harmony one imagines an Artistic Director places them in the fields each morning for the pleasure of those passing by. Rolling hills give way to forests, and eventually to a barren highlands, with two snow-covered, volcanic peaks rising dramatically from the plains, at the edge of an immense lake. Then again into forests, velvet green fields, and, suddenly, we are looking are the roiling waves of a vast ocean. Rain and wind gives way to glorious clouds, then sunshine, then clouds and rain again. Also cheese-tasting (and buying) and “the best ice cream in New Zealand” at the not-to-be-missed tourist stop, with a wandering peacock there to greet us. New Zealanders are very health conscious. Whole grain and gluten-free options abound. Eggs, produce, and dairy products are delicious. Inasmuch as good food is the “last legitimate pleasure of the yogi,” we are enjoying ourselves immensely. Hutt Valley is the home of Kavita’s partners in the planning of this trip, Bryan and Linda Rose. Bryan is a long-time disciple of Master. Master’s devotees here have a national retreat every year and through those events Kavita and Bryan became friends. When she shared Ananda with him, he took to it enthusiastically. He and Linda planned to be at SRW this year, but a family emergency prevented it. So, except for e-mail and a few Skype calls, this was our first meeting. They have a lovely spacious home where, to our joy, we have all managed to find a room or cubbyhole to stay in. On a tour like this, everyone adds to the magnetism and even a day apart feels like a long time. Bryan Rose is well-educated in Master’s teachings and in the almost 20 years of being a disciple has obtained many unpublished or out-of-print writings of Master or collections of teachings from other disciples. We’ve enjoyed a box full of Master’s magazines dating from 1925, a notebook of quotes from Brother Bhaktananda and also from Brother Turiyananda, among other treasures. In advance of our arrival, we shipped Ananda Publications from India and Bryan has been avidly reading through Swamiji’s books and The Wisdom of Yogananda series. We brought him a copy of Fight for Religious Freedom, by our attorney Jon Parsons and, as you can imagine, we’ve had some lively discussions as Bryan, Kavita, and us sort through the amazing SRF-Ananda karma. After all these years I’ve come to a very simple way of explaining it. SRF is centralized. 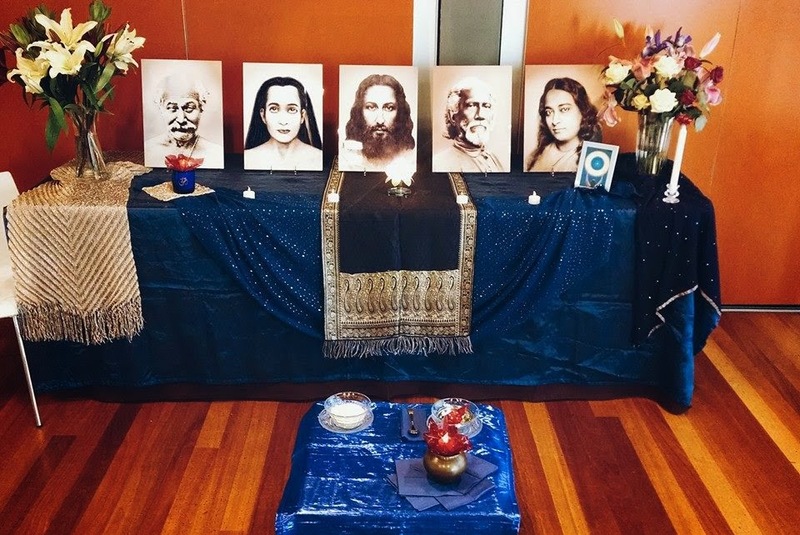 Ananda is de-centralized. For each organization, this is both an organizational and a spiritual principle. 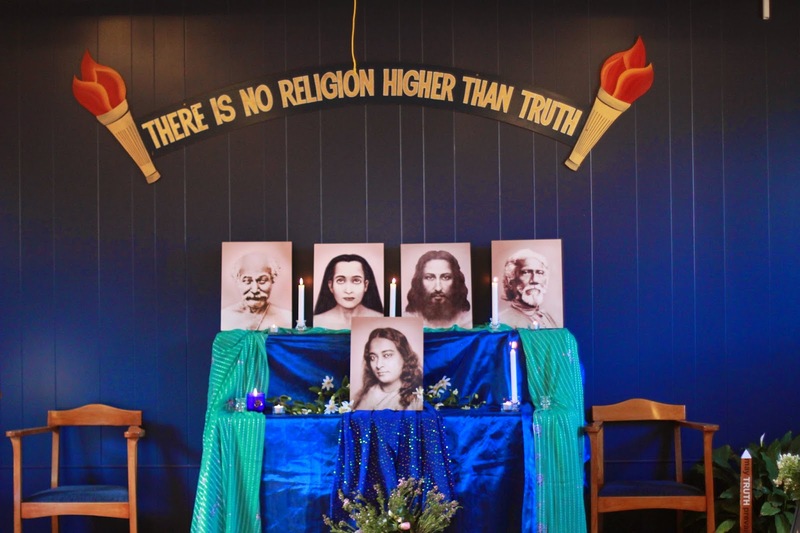 Being so far away from the “headquarters” of both SRF and Ananda, it is more obvious than ever: So few on this planet strive to live in the light. What pleases God most of all is to love one another, for in God, all are equal. Whoever loves God is our brother and sister. We had a full weekend of programs in Hutt Valley. The venue again was lovely, a room in the Dowse Museum of Art. Bryan and Linda live right on the edge of town, and the Museum is within walking distance. Transporting books and all the other paraphernalia of Ananda-on-the-Road required that The Marshmellow (the name of our van...we’ve changed the spelling from “mallow” to “mellow” to express the attitude of those traveling within it) still had to be used, but most of us walked back and forth. New Zealand is a major exporter of dairy products and other agricultural goods. If they could package and sell the prana in the air, however, it would be the richest nation in the world. The turnout here was smaller -- about 15 for the free lecture and no more than 6 for any of the classes. Kavita has been active in Hamilton for some years, and she has built up a group. Here Bryan is just getting started with Ananda, so this is the beginning. Having a whole weekend together, we shared lunch, and sometimes dinner, bringing our new friends to Bryan and Linda’s where we ferreted around in the kitchen and made meals together. These informal interactions are as important -- perhaps more so -- than the formal classes. Ananda is a way of being in the world. It is spiritual family. When we showed Finding Happiness here, there was hardly a dry eye in the room. Swamiji’s presence is so powerful. 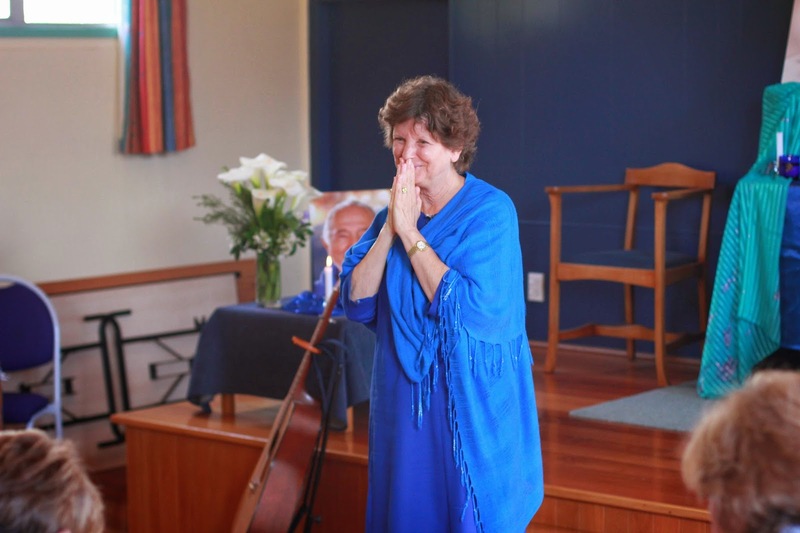 And the picture of what life can be like when you put God first is thrilling, both for those of us who have decades of experience in Ananda, and for those seeing it for the first time. Although life in New Zealand is beautiful in so many ways -- national health care, among other things, removes many worries -- depression is a major problem. Kavita speculates this is because life is so comfortable, there is nothing to strive for and the “agonizing monotony” as Master’s calls it in Autobiography of a Yogi, leaves people groping for meaning. Master’s teaching can be a solution. Nature is vibrant, and much respected. The biggest ecological problem is imported predators -- rats and other rodents -- brought over on the boats with the Europeans. This was devastating to the indigenous bird population, and efforts are being made now to restore the balance and protect endangered species. Bryan is deeply engaged in this and has taken Dambara into the high hills on an outing related to this effort. Yesterday, Bryan took Dambara and me to a nearby park. In typical fashion, it was sunny for the drive there, but as soon we reached the parking area, dark clouds moved in, torrential rain fell, then hail. A few minutes later, the storm abated, and we decided to take the walk we had planned. 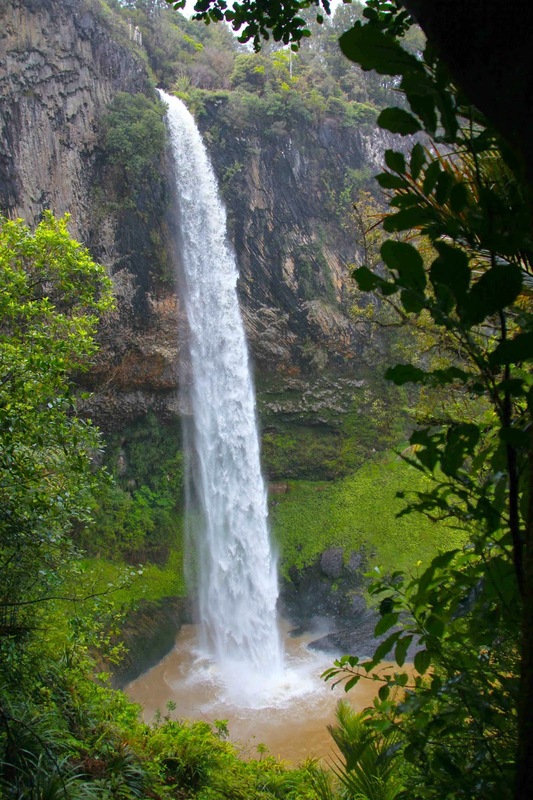 It was a rainforest after all, so getting wet should be part of the story. When you travel halfway around the world you want experiences you can’t get in your own neighborhood. 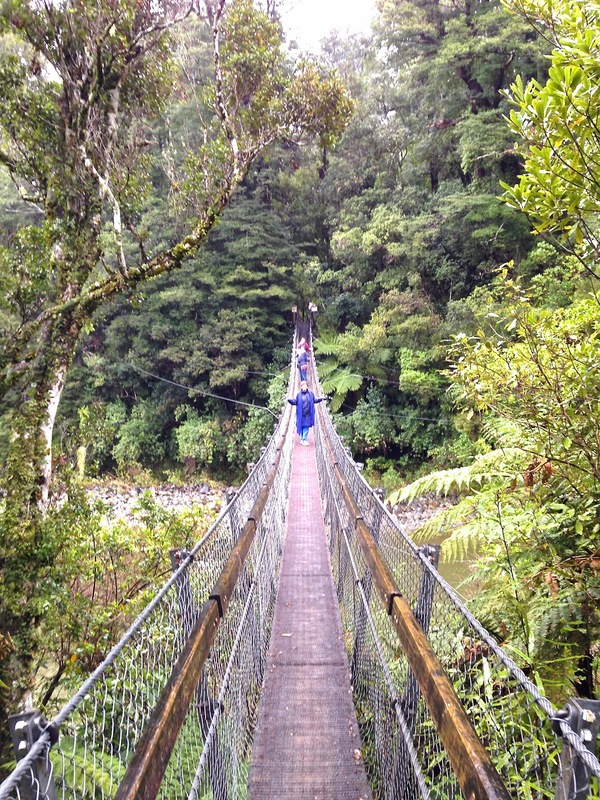 We crossed a river on a swinging bridge, wandered through thick forest down to the river’s edge. This area was used for Rivendell in the filming of The Lord of the Rings. You can imagine how magical it was. Tonight we have a program at the local Theosophical Society. The subject is The Yugas. Should be interesting. 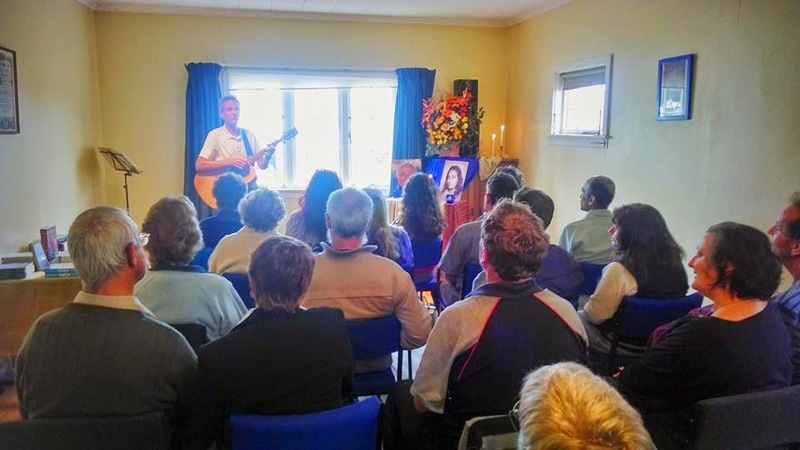 This weekend we will be in Wellington on Friday and Saturday, then Palmerston North for Sunday Service and a class in the afternoon. For me, this journey is about attunement: To be in the moment, to feel what God and Gurus want, and as best I can to be their messenger. P.S. Turnout for the first Wellington talk was about 35 people -- a full house of dynamic and interesting people. Many plan to come to the classes on Friday and Saturday night. More about that next letter. P.P.S. More photos of the trip so far are online here.